Rereading this brilliant book after 40 years, I found it even more impressive than the first time. It’s both an adventure yarn – encompassing an earthquake, a hurricane, children abducted by pirates, a murder, and various betrayals – and an incredibly insightful exploration of the mystery that is childhood, viewed from both children’s and adults’ perspectives. Truly breathtaking, both the plot and the depth and quality of the writing. Richard Hughes's celebrated short novel is a masterpiece of concentrated narrative. Its dreamlike action begins among the decayed plantation houses and overwhelming natural abundance of late nineteenth-century Jamaica, before moving out onto the high seas, as Hughes tells the story of a group of children thrown upon the mercy of a crew of down-at-the-heel pirates. A tale of seduction and betrayal, of accommodation and manipulation, of weird humor and unforeseen violence, this classic of twentieth-century literature is above all an extraordinary reckoning with the secret reasons and otherworldly realities of childhood. Richard Hughes (1900-1976) was born in Surrey, England, but his ancestors came from Wales and he considered himself a Welshman. After an early childhood marked by the deaths of two older siblings and his father (his mother then went to work as a magazine journalist), Hughes attended boarding school and, with every expectation of being sent to fight in the First World War, enrolled in the military. Armistice was declared, however, before he could see active service, and Hughes was free to go to Oxford, where he became a star on the university literary scene, with a book of poems in print and a play produced in the West End by the time he graduated in 1922. 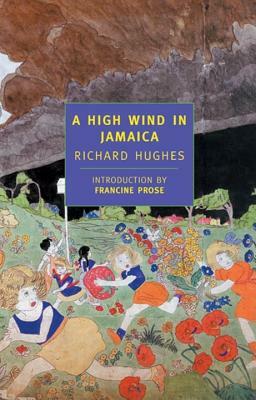 Hughes’s first novel, A High Wind in Jamaica, came out in 1928 and was a best seller in the United Kingdom and America. In Hazard followed ten years later. Hughes also wrote stories for children and radio plays, but his final major undertaking was the “The Human Predicament”, an ambitious amalgamation of fact and fiction that would track the German and English branches of a single family into the disaster of the Second World War while offering a dramatic depiction of Hitler’s rise to power. The work was planned as a trilogy, but remained incomplete at the time of Hughes’s death. The first volume, The Fox in the Attic, appeared in 1960, to great critical acclaim; volume two, The Wooden Shepherdess, was published in 1973. All of Hughes’s completed novels are available from NYRB Classics. “A surprisingly terrifying short novel about children kidnapped by pirates, elevated from its silliness by surprising moments of violence and introspection, as well as repeated flourishes of literary brilliance. Also, it’s funny.” —Emily Temple, Lit Hub, "20 Short Novels to Stay Up All Night Reading"
"A High Wind in Jamaica by Richard Hughes is like those books you used to read under the covers with a flashlight, only infinitely more delicious and macabre."